The Vancouver Condo Buzz » Phase 1 Release at ORCHID Port Coquitlam Riverside Condos by Quantum Properties > Truly Affordable PoCo Condos starting from just $149,900! « ULTRA BOUTIQUE PROJECT > The Views at 1212 Tsawwassen Luxury View Homes for Sale from $999k > 19 Unique Luxury Tsawwassen View Condos Now Previewing! Phase 1 Release at ORCHID Port Coquitlam Riverside Condos by Quantum Properties > Truly Affordable PoCo Condos starting from just $149,900! LIVE POCO. LIVE RIVERSIDE. Live at ORCHID Port Coquitlam Condos! Affordably priced from $149,900! The truly affordable Port Coquitlam ORCHID PoCo condos for sale will be launching in late Spring/early June 2013! 1 bedroom condos at the ORCHID Port Coquitlam real estate development will range from below $150k, which makes them the most affordable Tri-Cities market suites available to home buyers! Great for first time buyers and investors alike, the Orchid Riverside Homes in PoCo Tri-Cities are brought to you by Quantum Properties, a BC company that has been developing properties and constructing multi-family residential and commercial buildings since 2000. 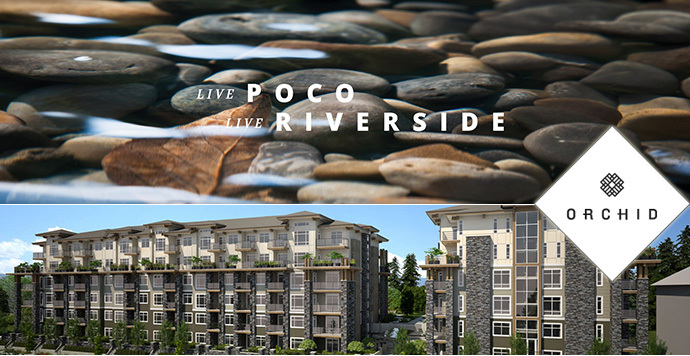 The ORCHID PoCo condos will be situated at 2455 Wilson Avenue Port Coquitlam. Affordability is now available! Register today for your priority preview opportunity. With just about everything in the neighbourhood, the new PoCo ORCHID Condos has just the right amount of urban amenities whilst being situated in an established and quiet community. In addition, it’s a very easy commute to and from the city. Just steps from the river, the modern and truly beautiful architectural design of the new Port Coquitlam presale condos also features on-site amenities that includes three separate work out rooms, a yoga studio as well as a sauna. Outdoor amenities include a private meditation garden, multi level water feature, extensive professional landscaping, beautiful patios and walkways. More info about the ORCHID Port Coquitlam condos online at www.orchidcondos.com. PoCo has all the conveniences of a small city with the natural attractions of a riverside community. ORCHID Port Coquitlam condos is perfectly positioned so that you and your family can enjoy the best of both worlds, every day! In addition, the riverside condos also features 16 different and unique floor plans. The ORCHID PoCo condo building will include the construction of two 6 storey boutique low-rise buildings. The total offering is 185 market units for sale. The project will be launched in 2 phases. Phase 1 at Orchid PoCo condos will be launching in June 2013. The two buildings will be 6 storeys in height and will be centred around a central courtyard. Building 1 at Orchid Port Coquitlam presale condos will introduce 109 units (40 one bedroom, 49 two bedroom and 20 2 bed+flex units). Building 2 at Orchid PoCo includes 76 units (29 one bed and 47 two bedroom suites). In addition to the Traboulay Trail, Gates Park and the Coquitlam River riverside district just next door, the Port Coquitlam Orchid condos will also feature on site landscaping and green space for you to enjoy. This includes a multi-pool water feature flowing from the upper greenspaces down to the beautiful entrance, and extensive patio area with arbours, and walkways, benches and gardens throughout the professionally landscaped grounds. In addition, the other on-site amenities at PoCo Orchid condos includes a workshop/bike maintenance area, pet wash station, guest suite (professional furnished and designed), meeting room with small kitchen, cardio room, weight room and a games room with table tennis. Other onsite amenity spaces at the PoCo Orchid condos include a hobby crafts room, movie room, yoga studio and sauna, a business centre, library and secured bike lockers and underground parking. All homes come with the new Home Warranty too. Port Coquitlam, also referred to as PoCo by local residents, is a growing community of nearly 60,000 people. With a great proximity to local amenities and services as well as to downtown Vancouver, Port Coquitlam is fast becoming the destination and home choice for many buyers. The project site at the new Orchid Port Coquitlam presale condos is at 2455 Wilson Avenue PoCo and their tagline is: Everything at Your Doorstep, which is very true. From the West Coast Express commuter train to the Port Coquitlam bus exchange which are both five minutes walk from your front door at the presale Port Coquitlam Orchid condos to the upcoming Evergreen SkyTrain Line, there are plenty of mass transit routes you can take to get to where you want to be in minutes. In addition, the beautiful Traboulay PoCo Trail network features over twenty five kilometres of biking, hiking and walking trails along the mighty Coquitlam River. It runs adjacent to the presale Port Coquitlam Orchid PoCo condos. In addition to the Traboulay Trail, the new PoCo condos are also across the street from Gates Park area which has an off leash dog walking area, outdoor gym, picnic area, playground for children, tennis courts and numerous sports fields. From the new Fremont Village to Coquitlam Centre just minutes away, Port Coquitlam also features international cuisine and shopping outlets for you. There are 2 urban contemporary palettes available here that includes White on White or Shades of Grey. All of the homes will have approximately 9 foot overheight ceilings with Orchid Penthouse suites having vaulted ceilings (as per plan). In addition, the presale PoCo Orchid condos will have wide plank vinyl laminate, engineered hardwood, carpet in the bedrooms and tilling. There are Berkley interior doors with modern hardware in addition to two inch privacy blinds on the large windows. There is an option to have a linear electric fireplace in the living space. Some of the extras at the Orchid Condos in Port Coquitlam real estate market include extra parking stall, secured storage locker (and extra ones if you require them). Other options include a linear fireplace in the master suite and even built in closet organizers. The White on White palette for the kitchen includes full height, contemporary cabinetry with high gloss, white flat panel doors. The counters in the palette will be square edged Bianco White quartz surfaces. The Shades of Grey palette at the new PoCo Orchid condos for sale will include shaker style gently stained maple veneer cabinets with sleek chrome hardware. The counters in this platte are square edge Juniper Trail quartz surfaces. The bathrooms at the presale Port Coquitlam Orchid condos include wall hung vanities with matching framed mirrors, wall sconce lights, full tiled surrounds, designer feature tile work, and 90 degree square line faucets and shower heads with contemporary flow. The standard appliance package at Orchid PoCo condos include stainless steel flush mount hood fan, dishwasher, side by side fridge with ice and water and a smoothtop slide in range. The optional upgrades include a built in stainless steel microwave and a front loading Maytag washer and dryer in the laundry closet.